East Central Railway Recruitment 2018 - Below are various recruitment notifications published by East Central Railway, Hajipur / www.ecr.indianrailways.gov.in. 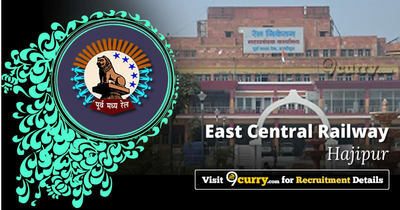 As of now, we don't have any active recruitment notification by East Central Railway featured here. We may update as soon as the organization announces a new job notification. If you are looking for any information related to previously organized recruitment drives by East Central Railway, you can browse through previous job notifications mentioned below and get the new updates or information you are looking for. East Central Railway Recruitment 2018 - Apply Online for 2234 Apprentice Posts in East Central Railway, Bihar, Uttar Pradesh. Online Applications are invited by East Central Railway, Hajipur from 11 Dec 2018 to 10 Jan 2019 05:00 PM for 2234 vacancies. East Central Railway Recruitment 2018 - Apply Online for 1489 Gateman Posts in East Central Railway, Bihar on Contract Basis. Online Applications are invited by East Central Railway, Hajipur from 18 Aug 2018 to 26 Aug 2018, 05 Sep 2018 and 15 Sep 2018 for 1489 vacancies. East Central Railway Recruitment 2018 - Job notification for Cultural Quota Posts in East Central Railway, Bihar. Applications are invited by East Central Railway, Hajipur on or before 14 Aug 2018 for 2 vacancies. East Central Railway Recruitment 2018 - Job notification for 12 Scouts & Guide Quota Posts in East Central Railway, Bihar, Uttar Pradesh. Applications are invited by East Central Railway, Hajipur on or before 04 Sep 2018 for 12 vacancies. East Central Railway Recruitment 2018 - Job notification for 21 Sportspersons Posts under Sports Quota in East Central Railway, Hajipur, Bihar. Applications are invited by East Central Railway, Hajipur on or before 04 Sep 2018 for 21 vacancies. East Central Railway Recruitment 2018 - Job notification for Homeopathic Consultant Post in East Central Railway, Bihar. Applications are invited by East Central Railway, Hajipur on or before 12 Mar 2018 till 06:00 PM for 1 vacancy. East Central Railway Recruitment 2018 - Apply Online for 1896 Apprentice Posts (Fitter, Machinist, Welder (G & E), Electrician, Mechanic M.V, Mechanic (Dsl), Machinist/Grinder, Laboratory Assistant (CP), Electrics Mechanic, Painter (General), Carpenter, Refrigeration & AC Mechanic, M.M.T.M etc. ) under Danapur division, Mughalsarai division, Dhanbad Division, Samastipur division, Plant Depot/Mughalsarai Division, Mechanical Workshop/Samastipur Division & Others in East Central Railway, Bihar. Online Applications are invited by East Central Railway, Hajipur from 30 Jan 2018 at 11:00 AM to 28 Feb 2018 till 05:00 PM for 1896 vacancies. East Central Railway Recruitment 2017 - Latest job notification for Scouts & Guide Quota Vacancies (Group C & Group D Posts) in East Central Railway, Hajipur. Applications are invited by East Central Railway, Hajipur on or before 09 Oct 2017 for 12 vacancies. East Central Railway Recruitment 2017 - Latest job notification for Cultural Quota Vacancies in Across India. Applications are invited by East Central Railway, Hajipur on or before 09 Oct 2017 for 2 vacancies. East Central Railway Recruitment 2017 - Latest job notification for 21 Vacancies under Sports Quota in Across India. Applications are invited by East Central Railway, Hajipur on or before 09 Oct 2017 for 21 vacancies.